The fluorescence quenching of rhodamine 6G by hydroquinone in methanol, water and dimethylsulphoxide (DMSO) is explored. A combination of solvent parameter could be necessary to explain solvatochromism in rhodamine 6G as the consideration for solvent refractive index alone is insufficient. Stokes’ shifts ranged between 25 and 29 nm. Rhodamine 6G’s fluorescence was effectively quenched by hydroquinone within the quencher’s concentration (0.01 to 0.05 M) which was used in this work, and the quenching data were in conformity with the Stern-Volmer’s model. Stern-Volmer’s constants (KSV) were 47.1, 29.6 and 14.8 M-1 in methanol, water and DMSO respectively. 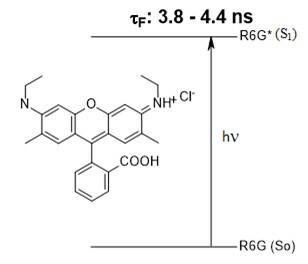 These values, together with the calculated bimolecular rate constants (kD) in the respective solvents, were used in the semi-empirical estimation of the fluorescence lifetimes (tF) of rhodamine 6G in the individual solvents. 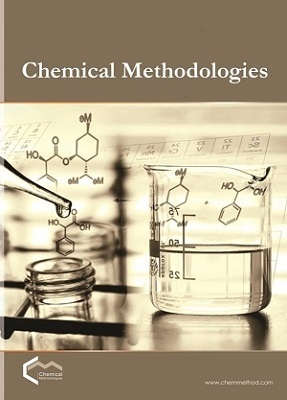 The tF determined values (3.78, 3.89 and 4.36 ns in methanol, water and DMSO respectively) are comparable with literature values. Schäfer F.P. (Ed.). Dye Lasers; Springer-Verlag: Berlin, 1990. Duarte F.J., Hillman L.W. (Eds.). Dye Laser Principles; Academic: New York, 1990. Lakowikz J.R. Principles of Fluorescence Spectroscopy, 2nd ed. ; Kluwer Academic/Plenum Publishers: New York, 1999, p 239.